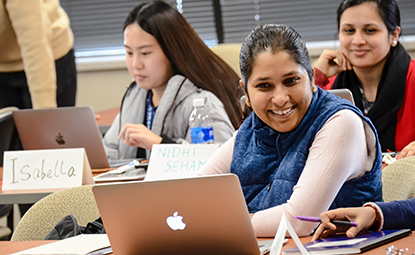 The Master of Engineering Management (MEM) program is offered at two Twin Cities, Minnesota locations: MEM in Plymouth and Executive MEM in St. Paul. MEM in Plymouth will prepare you for a managerial role. The course content is suitable to all engineering disciplines, as well as those working in science, technology and mathematics. You will learn from faculty who actively work with with local companies. For engineers wanting to pursue technical leadership roles, it is an alternative to the MBA degree. The program is offered at St. Cloud State at Plymouth and is also available online through a synchronous Adobe Connect Connection as well as in asynchronous mode through recordings of lectures. Designed for full-time students to complete the coursework in 12 months as well as part time and on-line students to complete the program on a part time basis in 18-24 months. Graduates of the program are eligible for obtaining American Society of Engineering Management's certified associate engineering manager (CAEM) title on graduation. Faculty partner with local industries to provide students with hands-on experience through applied courses. International students have come to the program from Nepal, Malaysia, India, Nigeria, Ethiopia, Thailand and other countries. Full time students are eligible to apply for graduate assistantships and on-campus jobs. International students are eligible to use 11 months of CPT for completing their capstone project. The MEM program is a STEM program and offers international students additional STEM OPT. Training engineers to be managers since 2002. All faculty members have doctorates and extensive industrial experience. The editor of the American Society of Engineering Management (ASEM)'s Engineering Management Body of Knowledge (EMBOK) is a tenured faculty in the program.